Tee Tyler is an Assistant Professor at Texas Christian University. At the CSWE Conference in Atlanta, GA, USA, where many IASWG members did presentations for the CSWE Group Work Track overseen by IASWG members Carol Cohen and Alex Gitterman, we learned that IASWG member, Tee Tyler, was awarded the GADE 2016 Teaching Excellence Award. Tee's awarded work is a reflection of a teaching model he created for BSW group practice classes; he also presented this model at the CSWE 2016 Conference (Presentation Title: "Interpersonal Classroom Model: Using Qualtrics Surveys to Enhance Group Practice Education"). Tee uses a teaching approach he developed called the Interpersonal Classroom Model (ICM). The ICM approach places interpersonal skill training and professional relationship development as the primary focus of classroom instruction. Tee uses this approach to share the responsibility of creating a cohesive classroom environment with his students. By focusing directly on student-student, student-instructor, and classroom relationships, Tee prepares his students for colleague-colleague, colleague-supervisor, and agency relationships in a variety of interprofessional settings. The ICM approach implement three pedagogical strategies: experiential learning opportunities, journal writing, and evaluative surveys. Each week of class, students participate in experiential learning opportunities, e.g. classroom dialogue, group practice demonstrations, research team exercises, etc. After each week of class, students complete an online journal entry and Qualtrics survey where they evaluate their in-class experiences. This allows students to reflect on what they are learning and allows Tee to assess student progress and to prepare course content that addresses student learning needs. To read more about the award and Tee Tyler, click here. Afifa Yusufi has a variety of social justice experience professionally and as a volunteer. Early in her career she worked in post conflict regions with the U.S. Government, including Kandahar, Afghanistan; and Baghdad, Iraq. While working in these regions, she volunteered with various U.S. based non-for-profits who aided the women and children of Afghanistan and Iraq. In 2007 Afifa was awarded the VERA award from Bpeace due to her travels to the “Red Zone” in order to assist with determining the feasibility of launching Bpeace’s work in the country. Afifa was born in Kandahar, Afghanistan and is the youngest daughter of the late Afghan spiritual leader Mohammed Nabi Yusufi. Her family fled the Russian invasion of Afghanistan when she was only two years of age. She returned in 2003 to assist U.S. Medical and Civil Affairs units to aid destitute Afghans. Afifa attended Yeshiva University, Wurzweiler School of Social Work from 2013 to 2015. During such time she worked as a social work intern at the Schenectady Jewish Community Center (2013-2014) and a social work intern at the Behavioral Health Clinic, Veterans Administration Medical Center, Albany, New York (2014-2015). In August 2015, Afifa received her MSW from Wurzweiler, Yeshiva University. She currently resides in New York and is a Prevention Clinician at Trinity Alliance, in Albany. Hi Everyone! I currently work in Massachusetts, USA facilitating groups with adolescents. Most of my experience has been in a combination of correctional mental health as well as school-based mental health. My current focus is on violence prevention groups with gang involved youth, dating violence as well as girls who are at risk for exploitation. I got involved in IASWG as a way to connect to others doing group work. I am excited to attend the symposium this year and get to know others who share my passion for groups! I been a member of The American Group Psychotherapy Association as well as run groups for many years. 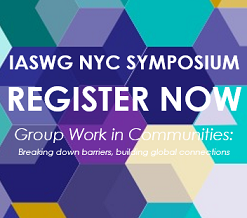 I’ve become interested in IASWG in part because of a desire to connect with others whom I can learn from and who run groups from a Social Work perspective. Charles Garvin, Ph.D is a friend of mine as well as a sometimes informal consultant. It is through him I first learned about IASWG. In the past, I have lead psycho education groups for couples, process men’s groups as well as my current four groups for adults. I am currently starting a group for middle school boys as well as a mixed group for high school students. I have a particular interest in “Transference/Counter transference Issues in Group Therapy” as well as “Immediacy in Group Therapy” and have lead workshops on both the State and local level. I have also been part of a team traveling to St. Petersburg, Russia to lead a three-day workshop on Dreams and Symbolic Communication in Groups. This was under the auspices of The Center for Group Studies (Lou Ormont) where I have received my group training. I am also interested in the study of small and large groups within the Tavistock tradition and continue to think about how to integrate the “Group as a Whole” with the needs of the individual. I hope to find new colleagues interested in talking about group therapy from different vantage points as well as the opportunity to be involved in the continued promotion of group therapy as a valuable treatment model. Founding Director, Jeff's Place Children's Bereavement Center, Inc. I was drawn to IASWG because of it's group focus. Like so many other group workers, I feel passionately about the power of groups and I am constantly inspired and humbled by it. I have worked for almost 20 years in the field of bereavement, specializing in children, teens and young adults. I am the Founding Director of two children's bereavement programs- Jeff's Place in MetroWest Boston, MA and FRIENDS WAY in Warwick, RI. In addition, I am a HUGE camp person, so combining my professional interests with my love of camp has been incredibly meaningful for me in my role as Clinical Director for Experience Camps- weeklong residential camps for grieving youth in CA, ME and NY. Finally, I'm a doctoral candidate at Simmons College School of Social Work, and my dissertation is an international study testing the validity and reliability of the Inventory of Youth Adaptation to Loss. If any of you are working with bereaved youth between the ages of 9-17, please let me know if you would like information about this study. Data collection runs through October. Please email me at [email protected]. To learn more, please also check out Jennifer's book, "You Are Not Alone". I run a quarterly discussion group for adult members of the adoption constellation. In the past, I ran a support group for caregivers of adults with significant medical needs. I am interested in relational trauma and complex grief specifically surrounding adoption, foster care, and kinship care. I am a former student of Dr. Greg Tully, and took his group work practice class. Dr. Tully made a point to emphasize that social work addresses the problems our clients have in making connections with what they need at all levels of practice. In an effort to serve clients at every level of practice, I have memberships with social work organizations that focus on individual-clinical practice, macro-advocacy practice, and through a mezzo capacity with groups--specifically the IASWG.